Previously only available on the high-specification M700i and M900i Series models, the BoomTrac and LED field lighting options are designed to increase the performance, uptime and low operating cost benefits of using John Deere’s mid-specification sprayers. The established BoomTrac automatic boom levelling and height control system uses ultrasonic sensors to measure the height of the boom above the crop or soil. If changes in the field or the target surface mean that the boom is no longer level, the system automatically adjusts it to maintain the optimum distance. As a result, spray drift caused by excessive boom height is greatly reduced and spray coverage on the target is improved. In use, the operator can specify a desired boom height for each nozzle type or choose a different boom height depending on the application or field conditions. The system is controlled via the tractor’s in-cab GreenStar or CommandCentre display and does not require an additional control panel, which also reduces cab clutter and complexity. Designed specifically for John Deere sprayers, the control algorithm used for BoomTrac has been formulated to match the dynamics of the company’s spray booms, to provide optimum performance. In addition, four headland control modes are available, including the ability to raise the boom to avoid obstacles, walls or hedgerows. The optional boom lighting kit features two high-powered LED lights mounted below the boom’s centre frame assembly. These shine a high-intensity white light below the structure, effectively illuminating both the boom itself and the spray pattern below each nozzle. In this way, the ability to both avoid obstacles during night-time spraying and identify nozzle blockages is greatly improved. Switching of the LED boom lights is also achieved via the CommandCentre in-cab display, so no additional controls are necessary. 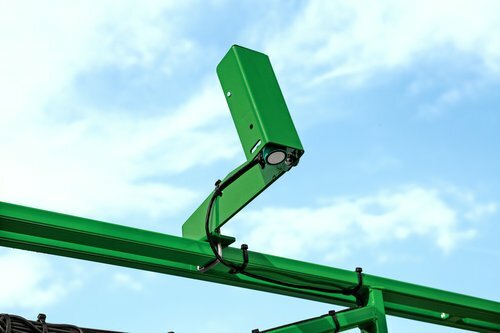 When compared to systems providing individual lights for each nozzle, the John Deere LED boom lighting kit means that only one light needs to be kept clean on each half of the boom; this avoids excessive downtime while still providing excellent overall visibility of the spraying operation. BoomTrac will be available for both John Deere M700 and M900 Series trailed sprayers from April 2016. The LED boom lighting kit option will also be available from this April for the M700 models, and from November 2016 for the M900 Series.